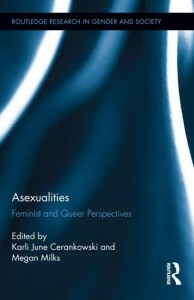 Asexualities: Feminist and Queer Perspectives. Volume co-edited with Karli June Cerankowski. Routledge, 2014. Now available in paperback. “On Writing the Girl Queer: Megan Milks and Kristen Stone in Conversation,” in Electric Gurlesque, edited by Lara Glenum, Arielle Greenberg, and Becca Klaver, Saturnalia Books, forthcoming Spring 2018. “Barf Transitive: Theories of Bulimic Writing as Feminist/Crip Resistance,” in Critical Innovations: Reading and Writing Experimental Texts, edited by Robin Silbergleid and Kristina Quynn, Palgrave/MacMillan, forthcoming Fall 2017. “Avant Slash Pop,” The Force of What’s Possible: Writers on the Avant-Garde and Accessibility, edited by Lily Hoang and Joshua Marie Wilkinson. Nightboat Books, October 2014. “Stunted Growth: Asexual Politics and the Rhetoric of Sexual Liberation.” In Asexualities: Feminist and Queer Perspectives. Volume co-edited with Karli June Cerankowski. Forthcoming from Routledge, November 2013. “‘Is this for real? Is that a stupid question?’: A Review of Dennis Cooper’s The Sluts,” electronic book review, 23 January 2012. “New Orientations: Asexuality and Its Implications for Theory and Practice,” co-written with Karli June Cerankowski. Feminist Studies 36.3 (Fall/Winter 2010): 650-664. “Janey v. Choukri: Power Plagiarism in Kathy Acker’s Blood and Guts in High School,” Kathy Acker and Transnationalism, ed. Polina MacKay & Kathryn Nicol, Cambridge Scholars Press (2009): 91-114. “When Eyeballs Land on Blazing Paragraphs: A Critical Introduction to Davis Schneiderman’s ScatØlØgically Yours,” Salt Magazine, Spring 2009. –Republished as afterword to novel, renamed Drain, Northwestern University Press, 2010. © 2013 MEGAN MILKS. All images are copyrighted by their respective authors.